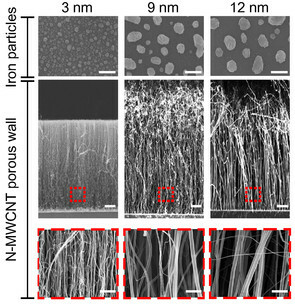 Tunable inter-tubular distance of carbon nanotubes for matching virus dimensions. Scale bars, top: 100 nm, middle: 10 µm, bottom: 200 nm. "Detecting viruses early in an infection before symptoms appear, or from field samples, is difficult because the concentration of the viruses could be very low -- often below the threshold of current detection methods," said Mauricio Terrones, professor of physics, chemistry, and materials science and engineering at Penn State, and one of the corresponding authors of the research. "Early detection is important because a virus can begin to spread before we have the ability to detect it. The device we have developed allows us to selectively trap and concentrate viruses by their size -- smaller than human cells and bacteria, but larger than most proteins and other macromolecules -- in incredibly dilute samples. It further increases our ability to detect small amounts of a virus by more than a hundred times."